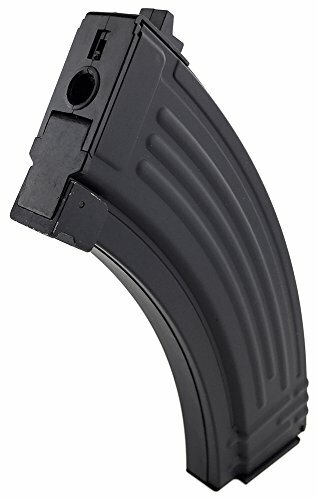 CMYA AK 47/74 150rnd Mid-Cap Waffle Magazine - Black, is a replacement magazine for Airsoft AK47 / 74 AEG, which are based of Tokyo Marui Style designs, such as CYMA AEG. The magazine holds up to 150 rounds, and is of a mid-cap (Medium Capacity) design, meaning the magazine is filled from the top with no requirement to wind the magazine to feed. This style of magazine is best filled with a speed loader, and is perfect for those Airsoft Skirmishers who are fed up of winding up their Hi-Cap magazine, or want a more realistic experience by having to reload their weapon. These magazine are great for those who quickly want to bulk up their magazine collection, by being low cost yet durable. The magazine is designed for CYMA and Tokyo Marui type magazine wells but may fit other manufacturers. 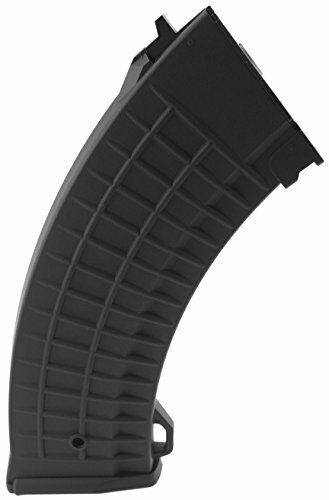 CYMA - AK AKM Style AK47/74 150rnd Mid Cap Magazine - Black is a replacement magazine for Airsoft AK47 / 74 AEG. The magazine is constructed entirely from Polymer, and features a rugged design. The magazine holds up to 150 rounds, and is of a mid-cap (Medium Capacity) design, meaning the magazine is filled from the top with no requirement to wind the magazine to feed. This style of magazine is best filled with a speed loader, and is perfect for those Airsoft Skirmishers who are fed up of winding up their Hi-Cap magazine, or want a more realistic experience by having to reload their weapon. These magazine are great for those who quickly want to bulk up their magazine collection, by being low cost yet durable. The magazine is designed for CYMA / Tokyo Marui type magazine wells but may fit other manufacturers. 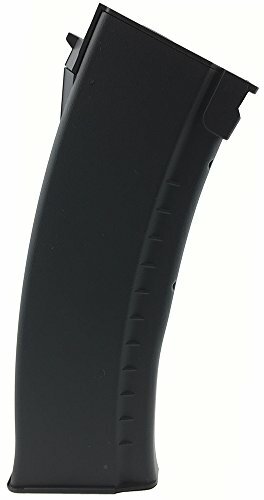 CYMA AK47/74 150rnd Mid-Cap Magazine - Black, a compact magazine for your Airsoft AEG AK47 or 74 series rifle. The magazine holds up to 150 rounds, and is a mid-cap (Medium Capacity) design, meaning the magazine is filled from the top with no requirement to wind the magazine to feed. This style of magazine is best filled with a speed loader, and is perfect for those Airsoft Skirmishers who are fed up of winding up their Hi-Cap magazine, or want a more realistic experience by having to reload their weapon. These magazine are great for those who quickly want to bulk up their magazine collection, by being low cost yet durable. The magazine is designed for CYMA / Tokyo Marui type magazine wells but may fit other manufacturers. 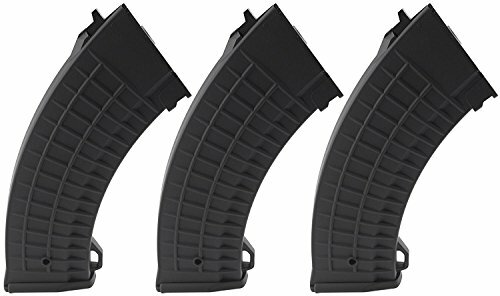 CMYA AK 47/74 150rnd Mid-Cap Waffle Magazine 3 Pack - Black, is a replacement magazine for Airsoft AK47 / 74 AEG, which are based off Tokyo Marui Style designs, such as CYMA AEG. The magazine holds up to 150 rounds, and is of a mid-cap (Medium Capacity) design, meaning the magazine is filled from the top with no requirement to wind the magazine to feed. This style of magazine is best filled with a speed loader, and is perfect for those Airsoft Skirmishers who are fed up of winding up their Hi-Cap magazine, or want a more realistic experience by having to reload their weapon. These magazine are great for those who quickly want to bulk up their magazine collection, by being low cost yet durable. Jing Gong AK47/74 600rnd High-Cap Magazine - Black, a compact magazine for your Airsoft AEG AK47 or 74 series rifle. The magazine is constructed with an Alloy shell with Polymer internals. Holding a staggering 600 BBs, the magazine can be wound up with the wheel on the base. An ideal budget metal magazine with a unique look but a usable capacity for any full auto enthusiasts. The magazine is designed for Jing Gong / Tokyo Marui type magazine wells but may fit other manufacturers. 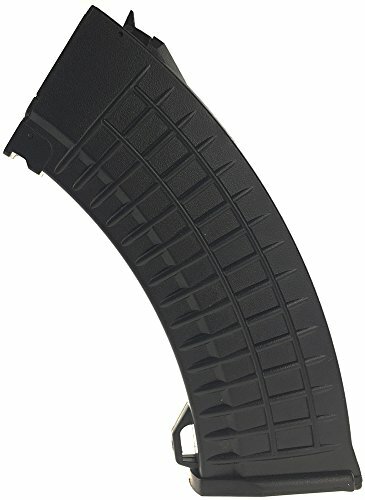 Jing Gong AK 47/74 550rnd Hi-Cap Waffle Magazine - Black, a large high capacity magazine holding up to 550rounds at one time and constructed entirely from a lightweight and durable Polymer. With a waffle print pattern the magazine has excellent grip especially in rain and other harsh weather and terrain. The magazine is designed for Jing Gong / Tokyo Marui type magazine wells but may fit other manufacturers. 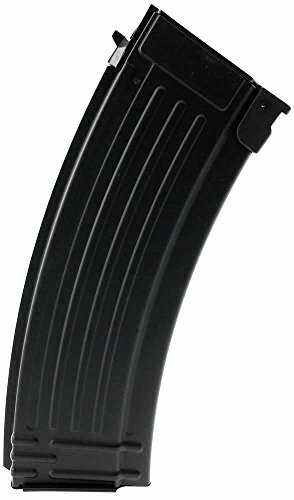 CMYA AK 47/74 550rnd Hi-Cap Waffle Magazine - Black, is High-Capacity (Hi-Cap) Magazines designed to fit into AK47/74 Airsoft AEG Electric Guns. The magazines have a capacity of 500 6mm BB and are constructed entirely from a lightweight and durable Polymer. The magazine is wound from the bottom, and can be filled from the top by opening up the hatch and pouring BB's inside. The magazine is perfect for those who want a more modern AK Magazine, rather than the standard Stamped Steel look. The magazine is designed for CYMA / Tokyo Marui type magazine wells but may fit other manufacturers. 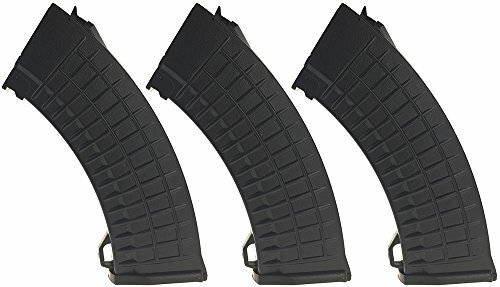 Jing Gong AK 47/74 550rnd Hi-Cap Waffle Magazine 3 Pack - Black, a large high capacity magazine holding up to 550rounds at one time and constructed entirely from a lightweight and durable Polymer. With a waffle print pattern the magazine has excellent grip especially in rain and other harsh weather and terrain. The magazine is designed for Jing Gong / Tokyo Marui type magazine wells but may fit other manufacturers. 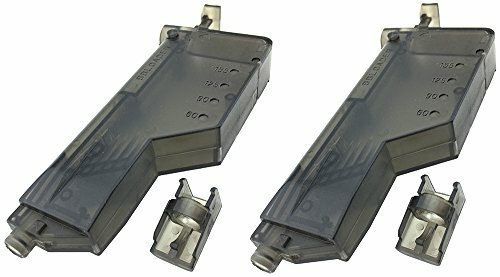 Fidragon BB Pistol Speedloader 2 Pack - Transparent. The speedloader is partially transparent with a Black tint so you can see roughly how many BBs you have left before you need to top up again. The loader is able to hold up to 155 BBs at a time. A must have piece of equipment for any Airsofter using Mid and Low capacity magazines for AEGs, pistols and other GBB primary weapons. This shows how to take apart an airsoft ak 47 magazine and fix the problem with the bbs not feeding. 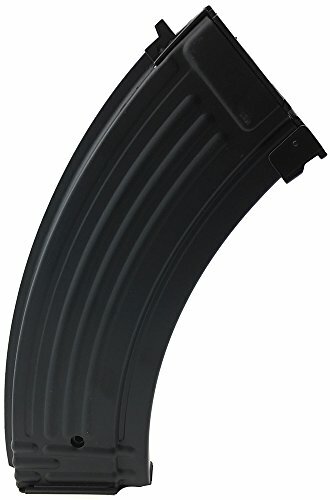 Compare prices on Airsoft Mid Cap Ak47 Mag at ShoppinGent.com – use promo codes and coupons for best offers and deals. Start smart buying with ShoppinGent.com right now and choose your golden price on every purchase.